It is officially one year since my bone-marrow transplant (BMT)! Today is my first re-birthday and I couldn't be happier. Those who have gone through a BMT would fully understand what this day is all about. I am beyond words. I have no words that can truly capture what I'm feeling. At the 8 AM mass, all I could utter were, "Thank you." I hope it is sufficient. I do hope I am worthy. 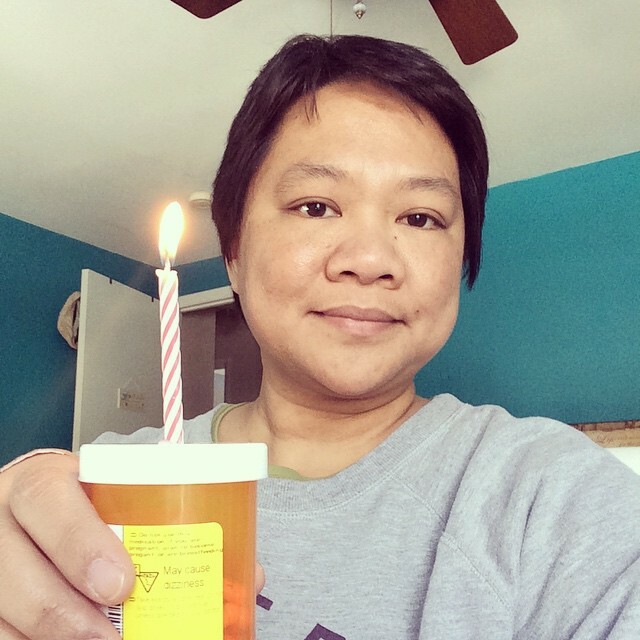 I didn't have a cake, so I just used one of my pill containers - "May cause dizziness." Later that day, Kepi took me out for an Italian lunch, and we shared a slice of Lemon Cream Cake. The cake was delicious and we loved it. This was taken on January 11, 2014. This bag took almost 6 hours to infuse. 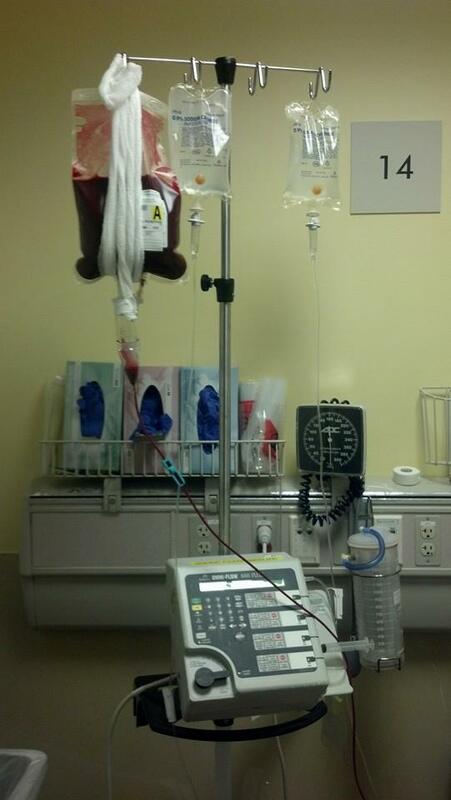 The photo above was taken on Day 0, the day I got infused with my donor's cells. I still remember it like yesterday. I cried. My heartfelt gratitude to my family, friends and everyone who gave me that extra push to keep going. Thank you to my donor. Thank you God for giving me a second chance in life. Oh congratulations on your first rebirthday. Here's to a whole lot more. Praying that you'll be back to your normal routine including all the traveling you used to do. So happy for you. Thank you, Photo Cache. Oh how I miss traveling. This is a big week of tests. Thank you. I will keep the faith and I will remain strong. Dear Kayni, I am so happy for you. You are looking great. Happy first re-birthday. Happy first re-birthday, Kayni! Keep going and stay strong. take care always. A belated happy re-birthday to you Kayni!! I've been out of the blogging loop too for about two years so haven't visited your blog, so I'm backreading like crazy here :) . My God, what a journey you had! And the courage to go through all that. Kudos to you! Keep going! And congratulations!! It seems that a number of bloggers have been on hiatus or have just completely stopped writing.